Freezing boiled potatoes is a simple task, and the frozen potatoes then are ready to use as needed. Prepare the frozen potatoes by mashing or roasting, or incorporate them into hot dishes, such as casseroles, scalloped potatoes, soups or stews. According to the British Potato Council, frozen, boiled potatoes are best when used within a month. The best potatoes for boiling and freezing are waxy varieties, such as round red, white or yellow potatoes, notes the Washington State Potato Commission. The low moisture content of waxy potatoes makes them more suitable for freezing than russet potatoes, which tend to become mushy. Look for firm, fairly smooth potatoes with no cracks, sprouts or large blemishes. Avoid potatoes with green skin, as the green coloration indicates the potatoes have been exposed to the sun. 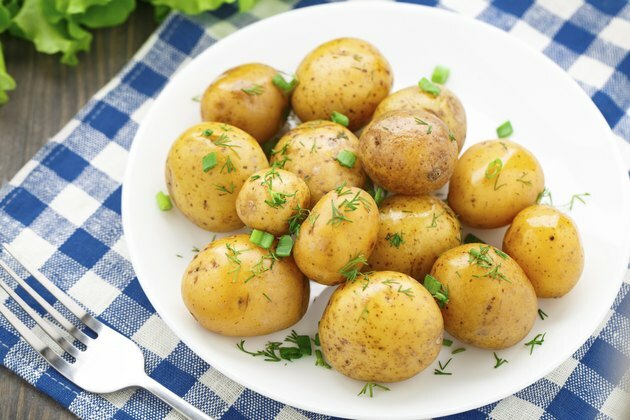 The green color makes the potatoes bitter and is toxic when eaten in large amounts. To prepare potatoes for boiling, scrub them under cool running water. Peel the potatoes and remove eyes and minor bruises. If the potatoes are large, cut them in half. You can also freeze potatoes cut into uniform half-inch cubes. Bring a large container of water to a full boil and add the potatoes. Cook the potatoes for about 6 minutes, or until they are slightly tender but still firm. Cubed potatoes require less time, 3 to 4 minutes. Cool the potatoes rapidly by immersing them in a large bowl of ice water, then drain them thoroughly. Spread the cooled potatoes on a baking sheet and place the sheets in the freezer. When the potatoes are firmly frozen, transfer them to rigid plastic freezer containers or resealable plastic bags. Although you can package and freeze the cooled potatoes immediately, freezing them on a baking sheet prevents the potatoes from sticking together and allows you to use only as many potatoes as you need. Washington State Potato Commission: Questions and Answers!